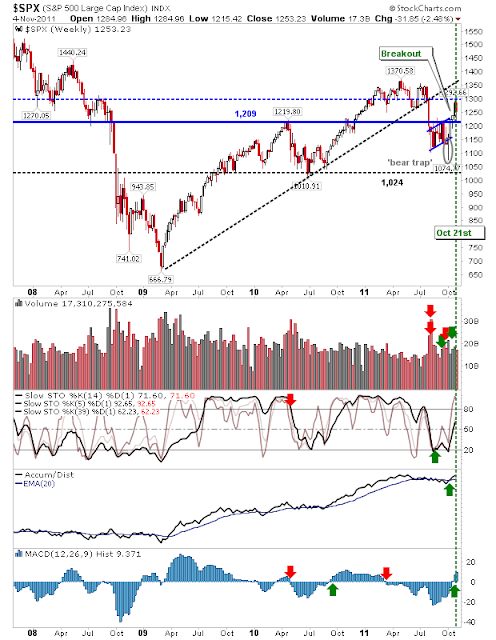 For the likes of the S&P and Dow, last week's respectable finish was about holding on to the gains generated by the breaks from the 'Bear Flags'. However, indices like the Russell 2000 and Nasdaq remain pinned by their 'Bear Flags'. 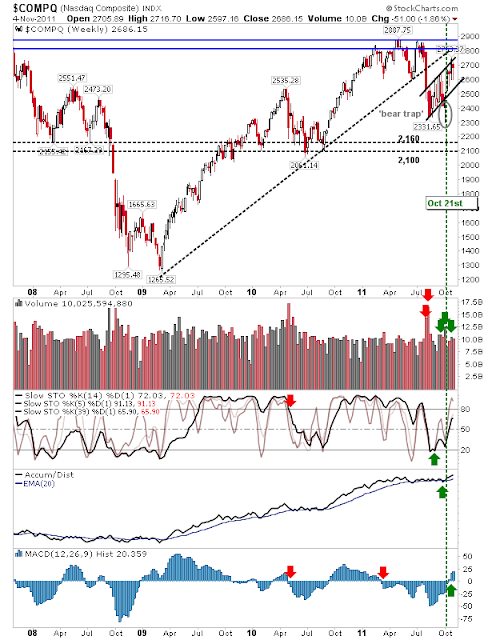 Overall, markets are finely poised with bulls looking at the emergence of a fresh rally while bears wait for the inevitable reversal. Influencing this psychology is the mess otherwise known as Europe which will keep both sides on their toes as they look to navigate a path ahead. Bulls have the seasonal advantage of the 'Santa Rally' to leverage against, while Bears have a choice of PIIGS to continue their spoiling tactics. 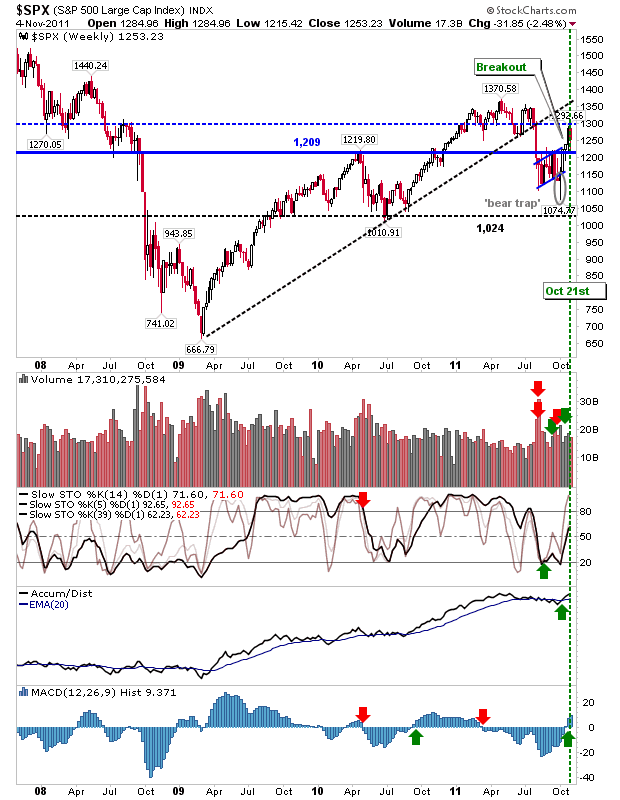 Looking at individual indices, the Dow held its break of dual band resistance at 11,739 and 11,939 with selling volume lighter than prior week's buying. While the S&P remains well above 1,209 support but still pegged by 1,300 resistance. 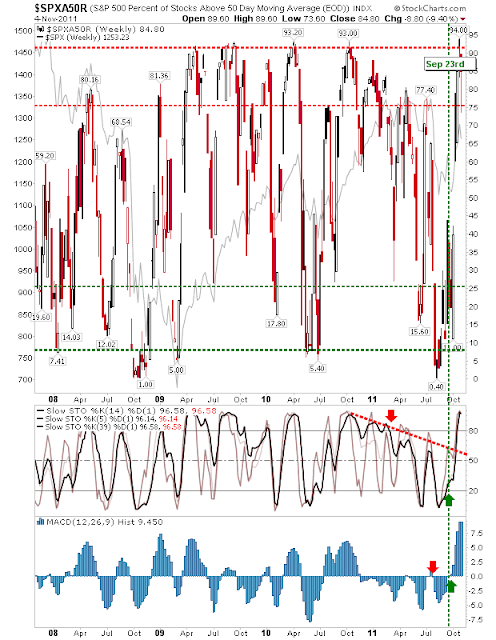 However, it is working with a breakout so the edge lies with bulls. The Percentage of S&P stocks above the 50-day MA is overbought and in need of a pullback; this means lower prices for the S&P. 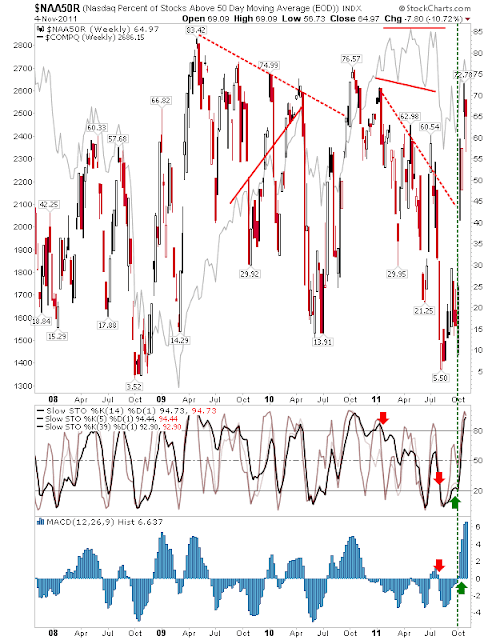 Although divergences are not uncommon (i.e. higher S&P prices as the percentage of S&P stocks above their 50-day MA fall) so as a cue to sell the index it's not a good one, but it's a warning to expect individual S&P stocks trading close to their 50-day MAs after a decline (no matter how small that decline is), to weaken further. 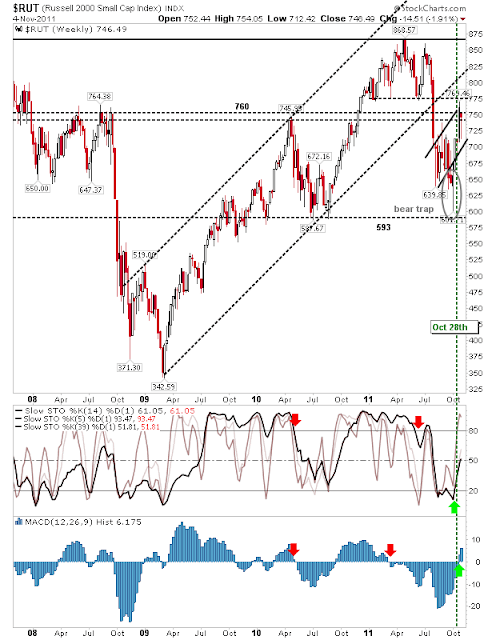 The Russell 2000 is frimly contained by its 'bear flag' and shorts will view the converged presence of 760 resistance with the 'bear flag' as an opportunity to attack with a stop above this level. A second point of resistance lies at 775. A spike high to 775 is perhaps the key threat to shorts looking to attack now. Bulls may be more willing to wait for 775 to break on volume before getting aggressive - particularly for bulls sitting on the sidelines. 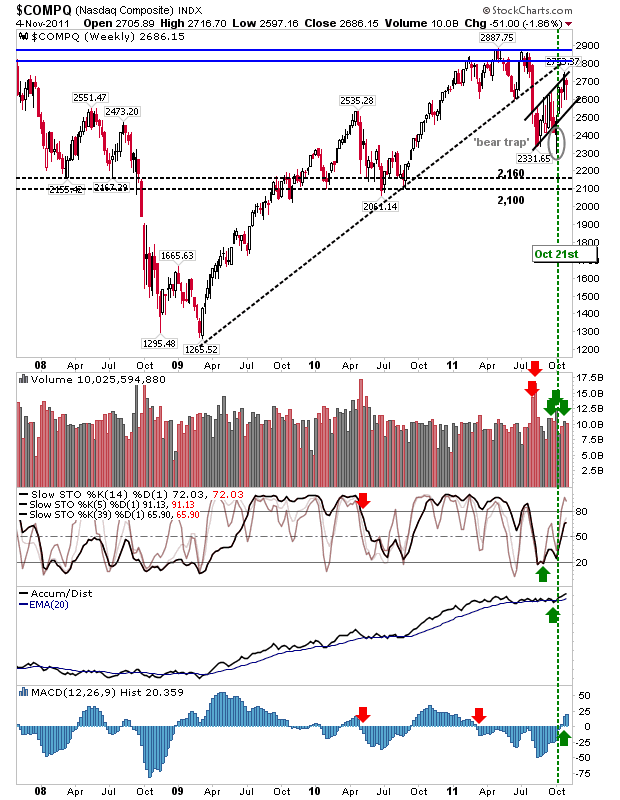 The Nasdaq is also curtailed by the 'bear flag' but it has at least rallied into the congestion zone which marked trading for the first part of the year. This is not such an attractive place for shorts to attack. 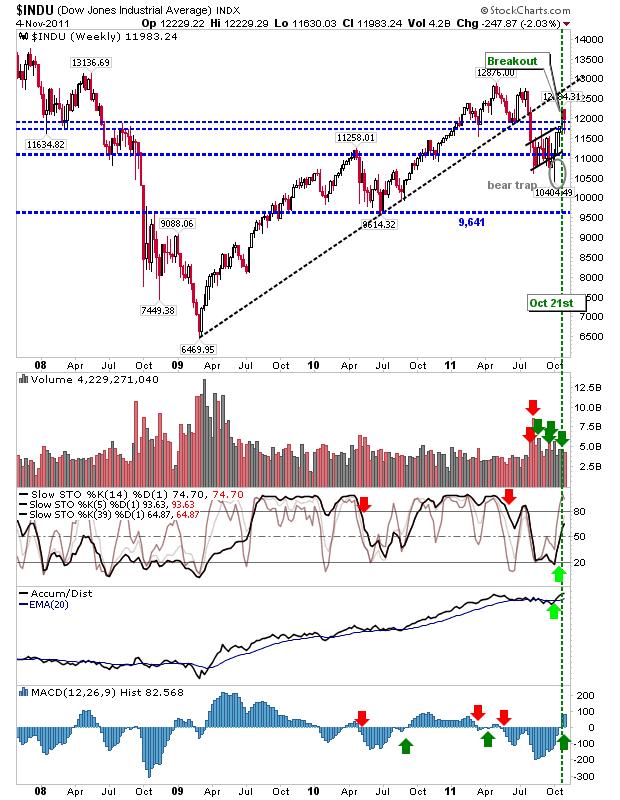 There may be enough demand to see a rally into the upper part of 2,800s before sellers and shorts take control of the action. Lower volume selling from last week confirmed bullish control of the rally. 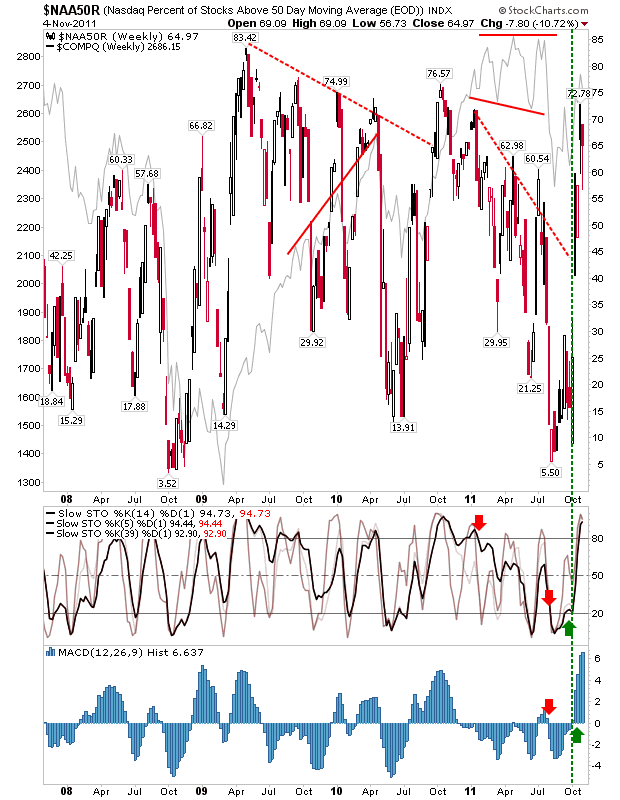 But as with the S&P there needs to be a certain level of caution for Nasdaq stocks trading close to their 50-day MAs. 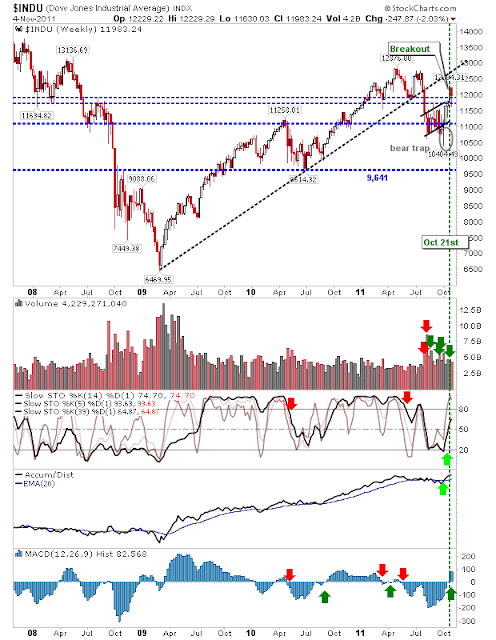 Only the cream of the crop will take the Nasdaq higher, underperforming stocks are likely to see their 50-day MAs broken over the coming weeks. 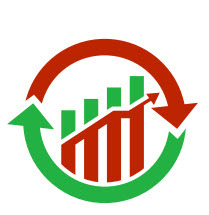 For next week, bulls will want to focus on Large Caps and market leaders in the Nasdaq and Russell 2000. Buying momentum should focus on these stocks as others start to drift away (below their 50-day MAs). It's still a vulnerable time for shorts to build positions, but stocks losing their 50-day MAs will be seen a good candidates for attack.